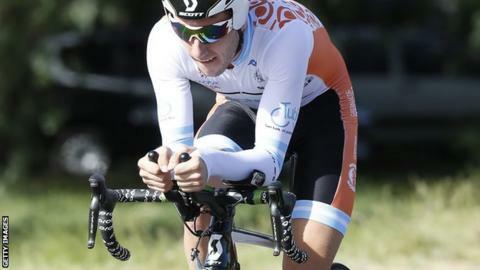 Britain's Adam Yates won the sixth stage of the Tour of Turkey to take the overall lead with two stages remaining. The 21-year-old, who rides for Orica GreenEdge, beat Italians Davide Formolo and Davide Rebellin in a solo attack on the uphill finish of the 183km stage. Estonian Rein Taaramae started the day six seconds ahead of Yates, but slipped back to just over one second adrift of the new leader after finishing fourth. Yates, who was second on stage three, is in his first year as a professional. His victory was another excellent result for Orica in a week in which Simon Gerrans won the prestigious Liege-Bastogne-Liege and Michael Albasini claimed Thursday's second stage of the Tour of Romandie. But Yates's twin brother Simon, another team-mate, broke his collarbone in a crash during Tuesday's stage in Turkey. Saturday's seventh stage is a 132km leg from Kusadasi to Izmir, which could finish in a sprint favouring Britain's Mark Cavendish, winner of three of the four sprint stages so far. The race finishes on Sunday with a 121km stage in Istanbul, which is also likely to end in a sprint. 2 Davide Formolo (Ita/Cannondale) +2"
3 Davide Rebellin (Ita/ CCC Polsat Polkowice) +2"
4 Rein Taaramae (Est/Cofidis), +7"
5 Kristijan Durasek (Cro/Lampre-Merida), +7"
2 Rein Taaramae (EST/Cofidis) +1.03"
3 Romain Hardy (FRA/Cofidis) +39.04"
4 Davide Formolo (ITA/Cannondale) +40"
5. Davide Rebellin (ITA/CCC Polsat) +44"